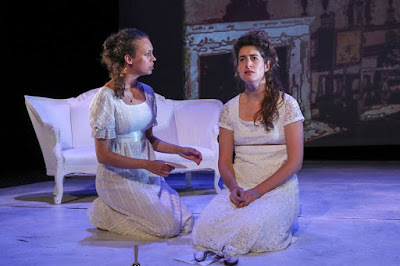 During a four-day stop at the Diana Wortham Theatre, Aquila Theatre, renowned for its laser sharp direction and skilled interpretations, expands its canon of classical works adapted for the stage with a bold and exciting new production of the ever-popular and poignant Sense and Sensibility on Friday, February 2, 2018 at 8:00 p.m. 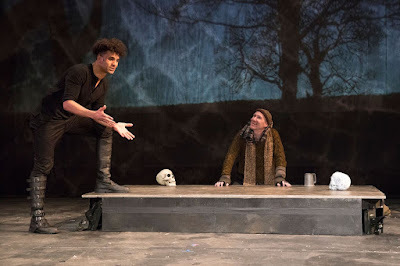 The following evening on Saturday, February 3 at 8:00 p.m., Aquila seeks to shed new light on the tragic Shakespearean story of Hamlet, plumbing the depths of rage, madness, love and death brought about by obsessive personal ambition. Wrapping up the residency is a Matinee Series performance of Hamlet for students and families, Monday, February 5 at 10:00 a.m.
Over the past several Mainstage Series seasons, Asheville audiences have come to know and anticipate the annual repertory offering of this creative company on the intimate Diana Wortham Theatre stage, and to experience Aquila’s “two plays in two days” tradition. Both upcoming productions are directed by Desiree Sanchez who is known for her innovated use of space, movement, design and sound. Jane Austen’s Sense and Sensibility is rich with seduction, courtship, love, heartbreak and surprise. Revolving around the lives of two sisters, Marianne and Elinor, this classic romantic comedy comes to life in new ways under the beautiful direction of Sanchez. With splendid costumes and exceptional attention to detail, every moment drives the story and keeps the audience fully captivated by this seductive tale. The following night, Aquila’s same talented 8-actor cast performs Shakespeare’s Hamlet. Written in 1602, this 400-year old classic continues to enthrall audiences with its exquisite portrayal of the human psyche within a rich landscape replete with deceit, mistrust, and schemes. The role of Hamlet is considered to be the ultimate test for actors, and Aquila’s Hamlet focuses on the family tensions and lightning changes of mood, rather than the struggle for dominance. Abstract in its setting that is stylistically a fusion between the late 1500s and the present day in Denmark, Sanchez’s imaginative direction, and the complexity and poetry of the play, take hold and build throughout the performance, creating a strong sense of movement and atmosphere. Aquila is considered the foremost producer of touring classical theatre in the United States and visits 50-60 American cities per year. With its bold reinterpretations of classical plays for contemporary audiences worldwide, the company has appeared in numerous festivals and at venues around the world — most recently in performances of A Female Philoctetes in Athens, Greece; and Shakespeare’s The Tempest at New York University’s campus and at La Pietra in Florence, Italy as part of their summer event series. Go deeper: Pre-show discussions with members of Aquila Theatre will take place at 7:00 p.m. both evenings at Asheville Music School, 126 College Street, just around the corner from Diana Wortham Theatre. Free for ticket holders of the 8:00 p.m. performances. Aquila Theatre's Asheville performances are funded in part by a grant from South Arts in partnership with the National Endowment for the Arts and the North Carolina Arts Council. Aquila Theatre is a recipient of a Shakespeare in American Communities grant through the National Endowment for the Arts, in partnership with Arts Midwest. The performances are made possible by Performance Sponsors Michael & Catty Andry, Diana Bilbrey, Patty & Gary Coleman, Dr. Alan & Suzanne Escovitz, Tina & John McGuire, and Parsec Financial; and by Mainstage Theatre Series Sponsors Arby’s, Epsilon, JAG Construction, Mosaic Realty, and Ward & Smith, P.A. ; with additional support from Media Sponsors WNC magazine and Blue Ridge Public Radio. The Diana Wortham Theatre is located at 18 Biltmore Avenue. The intimate theatre seats just over 500 and boasts exceptional acoustics and sightlines, making it the premier performance space in Western North Carolina. The Mainstage Series 2017/2018 Season Sponsors are 67 Biltmore Downtown Eatery & Catering, Asheville Citizen-Times, Blue Moon Water, Buncombe County TDA, Creative Energy, the North Carolina Arts Council, and the Renaissance Asheville Hotel. To obtain more information on the Mainstage Series or to purchase tickets for the February 2 & 3 performances by Aquila Theatre (Regular $40; Student $35; Child $20; Student Rush day-of-the-show $10), call the theatre’s box office at (828) 257-4530 or visit www.dwtheatre.com.